Scarce World War II Japanese Nautical Chart of the Panama Canal. Central America Approaches to the Panama Canal. A scarce Japanese World War II ear nautical chart or maritime map of the Panama Canal. The map covers the entire Canal Zone as well as the adjacent shores and islands on both the Pacific and Panama Bay sides of the isthmus. Like most Japanese charts of this period, the hydrography is based upon earlier charts by U.S. Navy and British Admiralty. The current example has been updated to 1926 from the original U.S. Government Chart of 1915. Includes countless depth soundings, some topographical detail. Nautical routes, and notations on lights and buoys. Issued as Japan Hydrographic Department chart no. 3715. 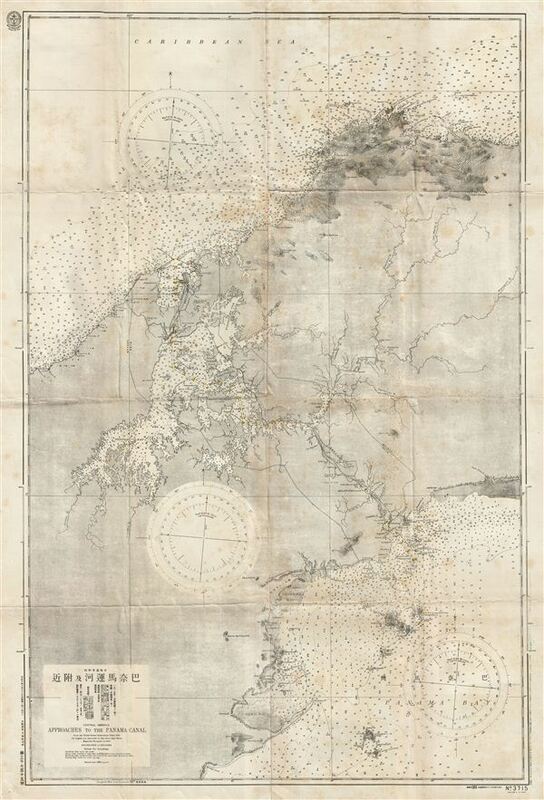 The Hydrographic Department of Japan (1871 - present) was established in 1871 to carry out various marine surveys and observations for the Japanese military. Initially the Hydrographic Department did little more than collect and update British Admiralty and U.S. Hydrographic charts focusing on East Asia, however, as the department matured, it began to commission its own survey work through the region. Today the Hydrographic department has been folded into the Japanese Coast Guard's Hydrographic and Oceanographic Department. Good. Buckling at original fold lines. Some spotting and toning.